Installation of Emergency Lighting for St. Rules Tower, St. Andrews, Fife. The 108 feet tower required the installation of emergency lighting. This challenging installation was required to light the spiral stairway and allow an emergency back up facility in case of power loss. R.B. 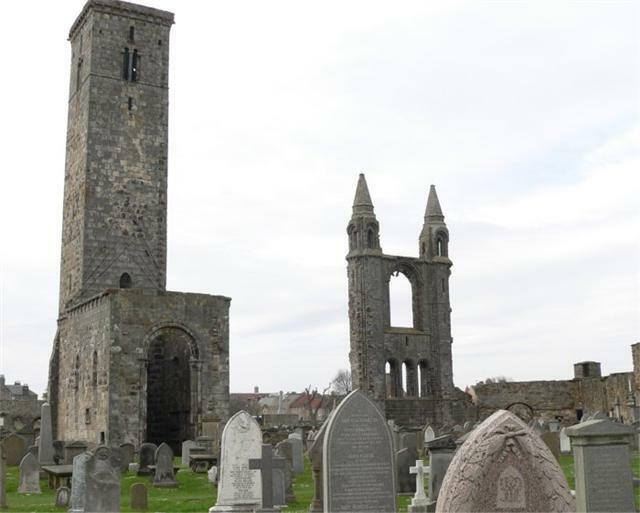 Grant Electrical Contractors worked closely with Historic Scotland masons to supply and install a system whilst retaining the look of the historic 12th century tower. St. Rule’s Tower, sometimes referred to as the Square Tower (108 feet high), affords a wonderful panoramic view over the town and harbour and to the surrounding countryside. Access to the tower requires an entrance token which can be obtained at the cathedral visitor centre. The climb to the top of the tower is via a rather narrow and steep spiral staircase (151 steps) on which it is difficult to pass those headed in the opposite direction. Be particularly careful on the descent, as spiral staircases have very little step room especially near the centre. For those who are careful, and reasonably fit, the view is well worth the effort.